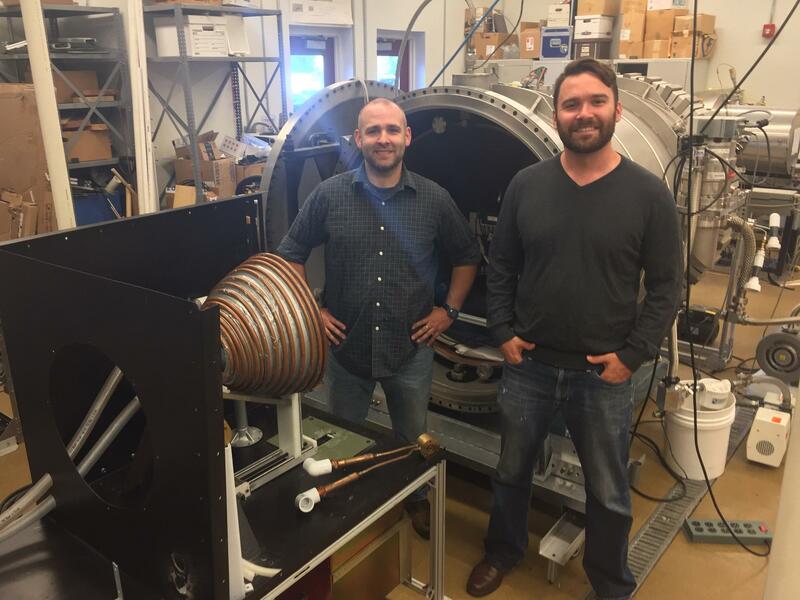 The Colorado School of Mines has started the world's first Space Resources degree program. Professor Angel Abbud-Madrid conducts an online class from his offices in Golden, Colo.
Colorado School of Mines Space Resources graduate researchers Curtis Purrington (left) and Hunter Williams stand next to experimental lab equipment in Golden, Colo.
A poster on the wall at the Colorado School of Mines commemorates the new Space Resources program. 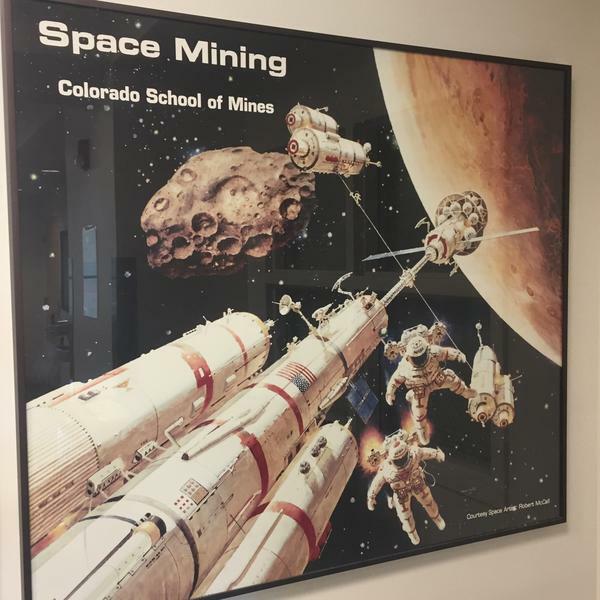 Starting this semester, the Colorado School of Mines is offering the world's first degree programs in Space Resources — essentially mining in outer space. It's not just academic institutions like the School of Mines taking note; a small but growing number of startups expect this to be very big business sooner than a lot of us might think. If people ever want to land on Mars, or explore beyond it, it's too expensive to rocket everything these missions will ever need from Earth. You need interplanetary gas stations on the moon or on asteroids, extracting raw materials to fuel future deep space missions. Angel Abbud-Madrid has been studying space resources at the School of Mines for two decades and directs the new degree programs. He said there is a lot in space that humans could find useful. "Anywhere from solar energy to microgravity," he said. "Yes, there's minerals and there are metals that will be mined, but there's also gases and water." Down below the geology museum on the School of Mines campus in Golden, Colo., some of Abbud-Madrid's students were at work in a laboratory. A 3D printer whirred in one corner and in the middle of the lab sat a reflective silver funnel wrapped in copper tubing. Graduate researcher Hunter Williams said they would be shining a light from an IMAX theater bulb through that funnel, condensing it down to a beam about an inch wide. "It's going to have the watts per square centimeter of about a thousand suns and we're going to hit an asteroid simulant sample with it and blow it up," he said. Williams quit his job as an engineer at aerospace giant Lockheed Martin to join the space resources program. He believes that an industry which still sounds like utter science fiction to many is coming fast. And it won't just put one or two people in space, but a whole space-faring society. "And it's not going to be 100 years from now," he said. "It's going to be maybe a decade from now." Master's degree student Liz Scott is starting the program while still working her engineering job and raising two kids. "It's always been frustrating that it seemed like going out into space, doing real work out there, has always been 10 years away and it's been 10 years away for 30 years," she said, adding that she believes space mining could finally spur more human activity beyond Earth. Ph.D. student Justin Cyrus has already started a company called Lunar Outpost that he hopes will eventually serve the space mining industry. "This is going to happen only once in our lifetime," Cyrus said. "This is an opportunity that we have to take." He said he wants to be in on the beginning of what he thinks could be a new industrial revolution. But Henry Hertzfeld, director of the Space Policy Institute at George Washington University, is not convinced. He believes over the next five to 10 years, there may be some small, isolated projects that demonstrate a concept or a new technology. "But, in terms of lots of jobs and a burgeoning commercial enterprise, I don't see that anytime soon," he said. Professor Abbud-Madrid at the School of Mines is nonetheless confident that now is the appropriate time for academia to get involved. He said interest in space resources has grown exponentially in the last five years from both the public and private sector. Although, he admits, the industry is in its infancy, and he warns prospective students to keep that in mind. Several new companies are betting there's money to be made in a new kind of mining - space mining. Yes, drilling into the moon or into asteroids to supply raw materials for future deep space missions. There is a university willing to bet on this, too, with the world's first degree program in space mining. Dan Boyce reports. ANGEL ABBUD-MADRID: Welcome, my fellow crewmates. BOYCE: ...Pretending he and his students are in a ship on an actual space mission. ABBUD-MADRID: We are now transitioning from the Earth to the moon. BOYCE: It's an online seminar class. 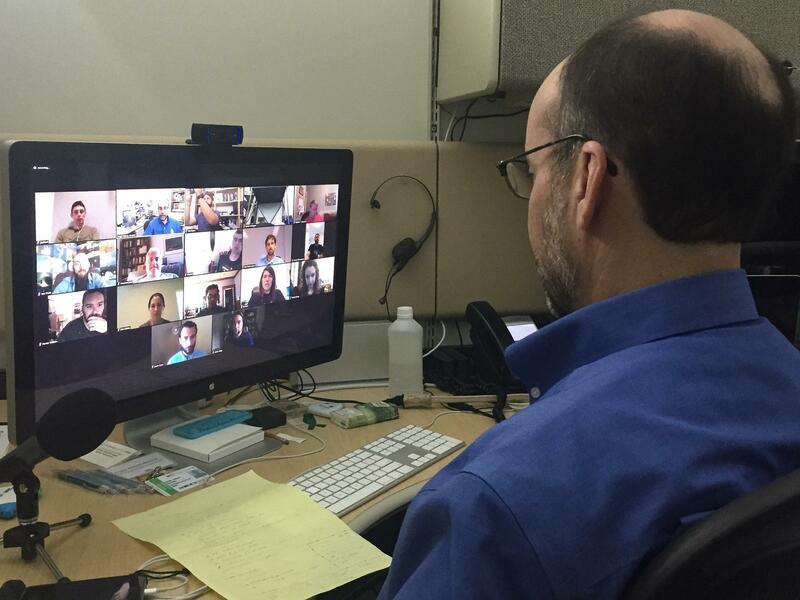 More than a dozen students are lined up on his computer monitor, many of them already working aerospace professionals. If people ever want to land on Mars or really explore beyond it, it'll just be too expensive to rocket everything these missions will ever need from Earth. You need interplanetary gas stations. And that's where space mining comes in or, as Abbud-Madrid politely corrects me, space resources - because there's a lot of useful stuff out there. ABBUD-MADRID: Anywhere from solar energy to microgravity - yes, there's minerals and there's metals that will be mined. But there's also gases and water. So it's broader than that. BOYCE: The School of Mines is not the only one to offer classes on the topic. Starting this year, though, it is the first to offer master's- and Ph.D.-level degrees. BOYCE: He takes me downstairs to a lab where some of the real action is taking place. And in the middle of everything, a reflective silver funnel wrapped in copper tubing. Graduate researcher Hunter Williams says through this funnel, they'll be shining light from an IMAX theater bulb, condensing it down to a beam about an inch wide aimed at a fake asteroid. HUNTER WILLIAMS: It's going to have the watts per square centimeters of about a thousand suns. And we're going to hit an asteroid simulant sample with it and blow it up. BOYCE: It's like a ray gun. WILLIAMS: It's very much like a ray gun. WILLIAMS: But a whole colony, a whole society of people. And it's not going to be a hundred years from now. It's going to be maybe a decade from now. BOYCE: Ph.D. student Justin Cyrus has already started a company, called Lunar Outposts, that he hopes will eventually serve the space mining industry. JUSTIN CYRUS: We said, this is only going to happen once in our lifetime. This is an opportunity that we have to take. BOYCE: He says he wants to be in on the beginning of what he thinks could be a new Industrial Revolution. Henry Hertzfeld is not convinced. HENRY HERTZFELD: I wouldn't go that far. BOYCE: He's director of the Space Policy Institute at George Washington University. We spoke to him on Skype. He believes, over the next five to 10 years, there may be some small, isolated projects that demonstrate a concept or a new technology. HERTZFELD: But in terms of lots of jobs and a burgeoning commercial enterprise, I don't see that any time soon. BOYCE: Back on the pretend spaceship, the students are speaking to a representative from a Japanese company called ispace that plans to send its first mission to mine water on the moon by 2020. And ispace's Kyle Acierno says they're hiring. KYLE ACIERNO: We're still growing rapidly and, and we're actively seeking for great talents. BOYCE: Which excites professor Abbud-Madrid. ABBUD-MADRID: Whoa, I can see the resumes flow in right now. BOYCE: Resumes that, in a few years, could be topped with the first Ph.D.s in space resources. For NPR News, I'm Dan Boyce. (SOUNDBITE OF NEAR THE PARENTHESIS' "NEUME") Transcript provided by NPR, Copyright NPR.